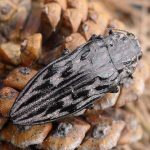 Pine bark beetles or pine borers are the single most destructive pest which attacks pine trees. They are reproduce quickly, migrate, and infest one active tree at a time, so it is important to start dealing with them immediately to minimize the spread to other trees. As a softwood, pine trees damage quickly and are able to harbor more insects than hard woods over the same period of time. When a tree is injured the sap runs freely and this increases the odds of attack by pine borers. Once the tree is targeted the beetles will penetrate the bark and excavate tunnels between the bark and the wood of the tree. Pine trees that are stressed or weakened are more susceptible to attack by pine bark beetles. Only the southern pine beetle is known to attack healthy trees. Typically, pine borers enter the tree at eye level and above. Look for tiny holes in the bark, and if you spot these beetles, act quickly. If you have a rust or bronze colored dead pine tree on your property, the abundance of the needles may indicate that it died quickly under the attack from pine borers. You should consider removing the dead pine tree entirely from your property to deter the infestation of other pine trees.